The Truth about UCL Qatar! UCL Campus was established in 2012 and offers various masters and research programs. You must, however, be aware of the terrifying work conditions and more than a thousand workers that died during the building work for the 2022 Fifa World Cup. LGBT+ rights in Qatar are not great either. Currently transgender people do not have the right to challenge their legal gender, male homosexuality is considered a crime and lesbians can also be punished for violating “morality laws”. It is repulsive that UCL, proud to be one of the first university in the UK founded on humanist grounds, have not reacted to those practices in Qatar. At UCL, 2 December 2014. Omar Raii introducing Shreya Paudel at our meeting asking “is UCL complicit in modern-day slavary?”. from discrimination of any kind. 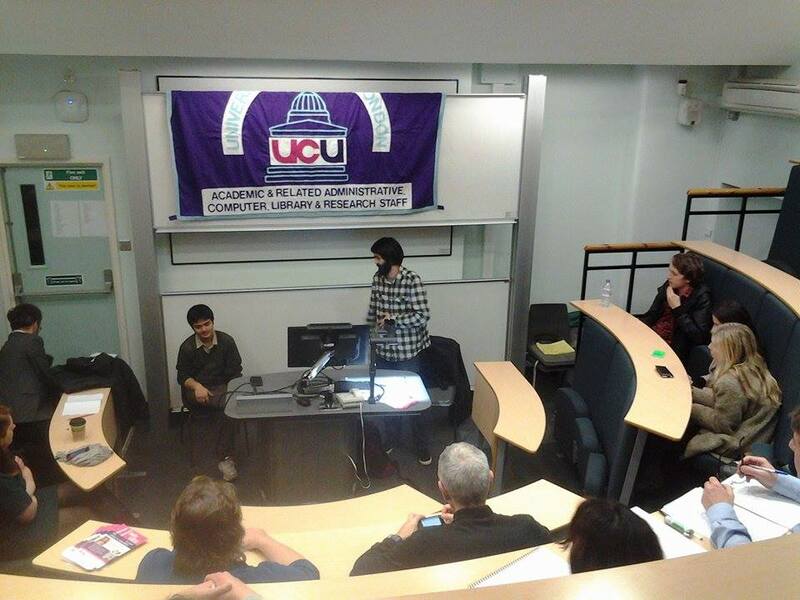 Last term we organised a meeting together with the University and Colleges Union (UCU) at UCL, asking “Is UCL Complicit in Modern-Day Slavery?”. We had three speakers, including Shreya Paudel – the NUS International Students’ Officer, whose uncle was kidnapped while investigating workers’ rights violations in Qatar – as well as Stephen Russell from the and Alison McGovern MP, the Shadow Children’s Minister. This term we will be stepping up our campaign to expose and shame the UCL bosses for their compliance with the Qatari Government’s abuses of human rights together with UCLU Amnesty International Society.